No, it’s not a quad. It is a unique four-wheeled motorcycle in its category. If you are thinking about making the leap to the bike, but a 125 cc is too short and you do not have an A2 or A card. There are three-wheeled scooters that, being homologated as tricycles. That’s why we tried here the Quadro4, a four-wheeled motorcycle SUV that will leave you that, to ‘Quadros’. Indeed, it is a three-wheeled scooter with one more on the rear axle and mounts a rear suspension that also tilts with the curves. Before starting, remove the handbrake that prevents the vehicle from moving forward and backward. Unlock both axes with the red lever on the shield. Before doing so, it is as if you were sitting in a pedal car. In the sense that you can move forward and backward, but do not lean. The downside is that it weighs much more than a conventional motorcycle. 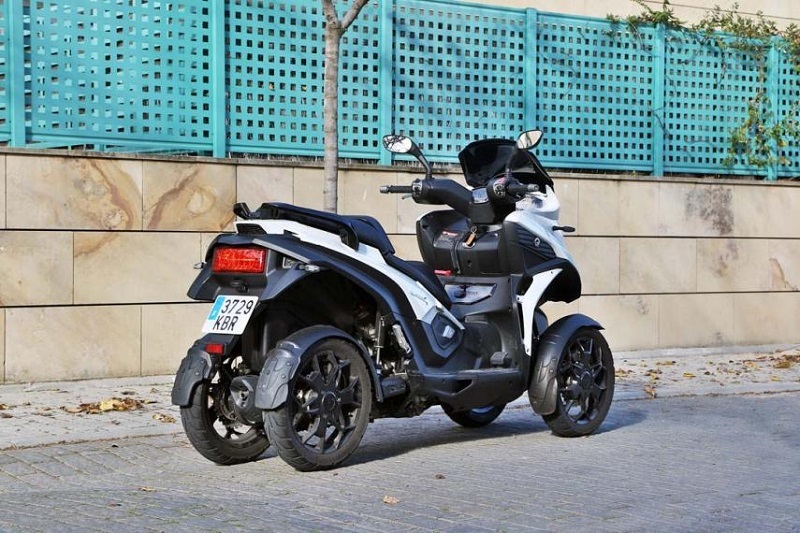 Even the equivalent three-wheel Quadro4 brand itself. So, you have to try to park it somewhere where you do not have to back off on the basis of ‘legs’. Because you will see them and you will wish them. In fact, it would not hurt a reverse gear, as they can ride some voluminous motorcycles. The lever that releases the suspensions and lets you topple is red and without any grace. But it seems robust and reliable, like everything in this curious artifact. Start! 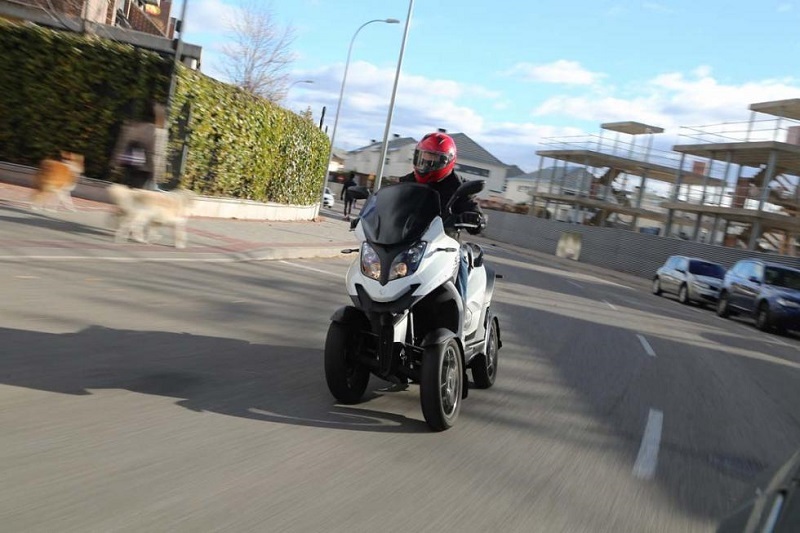 The Quadro4 has a comfortable hydropneumatic suspension that holds you upright minimally, which at the time of departure and at traffic lights. It allows you to hold a few moments without putting your feet on the ground. And if you take the trick, sometimes even this is not necessary, because staying in balance is simple. When you turn your fist, the 30 HP of power of this engine of 346 cc accelerates very well from below. With a blunt sound that does not become unpleasant. If you go on gas and notice that one of the two rear wheels skids a little, the other also moved by its own cardan. Corrects the issue as if entering a traction control, which does not exist. In addition to that, the behavior of the Quadro4 is very plumb with lateral wind, sliding surfaces. The brand speaks of a “SUV scooter”. It does not lack reason: you can put it on dirt roads, ramps, puddles, mud. There is even a version full of camping extras -Steinbock-. 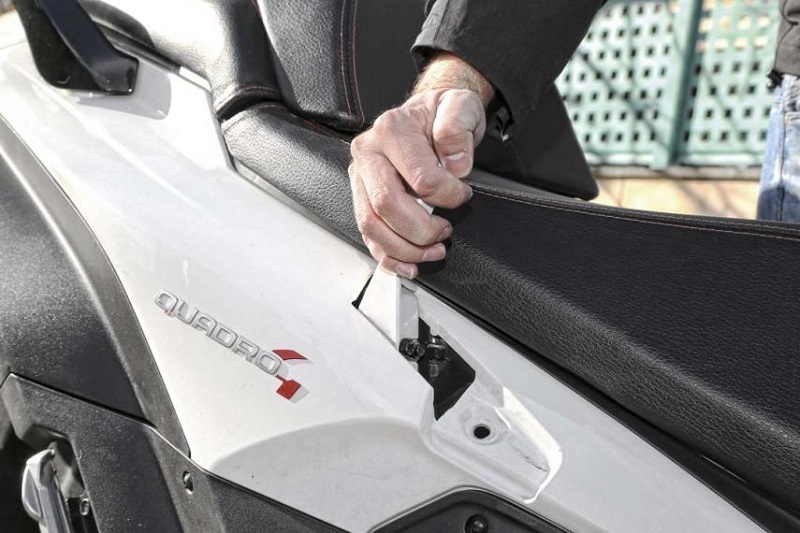 This is how the suspension system works, capable of tilting the Quadro4 up to 45 degrees. In return, yes. The top speed is very justita (llanea at 115 km / h but on the steep slopes does not exceed 90). Because only vacuum weighs 257 kg. This makes it difficult to maneuver it in stationary (a reverse would go to the hair). 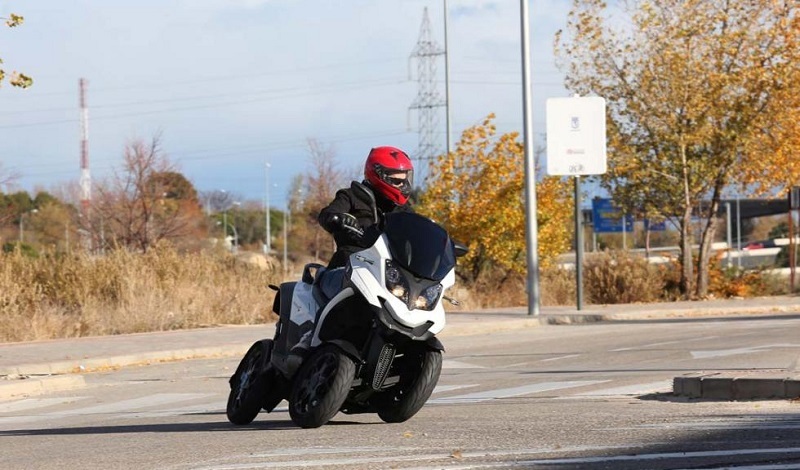 In this test, the Quadro4 (its price is 14,190 dollars ) accelerates very well and for even better thanks to its four discs, whose braking combined by handles or pedal supplies the ABS. But where it shines and surprises, even more, is in its stability and passenger comfort.